For the remainder of the turn, whenever you access a card not in Archives, trash it and suffer 1 meat damage. If the Runner plays By Any Means and then accesses an Archangel, can the Runner trash the Archangel before encountering it? Yes. Whenever more than one ability meet their trigger conditions, first the active player's abilities resolve, then the inactive player's abilities resolve. If one of those abilities moves the card being accessed to a different zone, no further "when accessed" abilities can resolve. If the Runner plays By Any Means and then accesses an advanced Project Junebug, can the Corp deal net damage? No. Similarly to the above example, Corp abilities like Project Junebug resolve after Runner abilities during a run on the Runner's turn, so Project Junebug will be trashed before its ability resolves. Can the Runner still steal accessed agenda after playing By Any Means? No. During a turn in which By Any Means has been played, the Runner can only steal agendas from Archives. By Any Means is a potentially powerful event. Being a priority event, you'll need it in hand when your turn begins (no Same Old Thing). After spending a and 2 to play it, you have 3 or possibly more s to make it worth the investment. Ideally then, you'll want to use all remaining s to make runs. This could be worth it against an asset spam deck. You may end up saving a lot of s if you can access certain assets/upgrades. But as you do "trash" the cards, CTM and Hostile Infrastructure still trigger. And you have to pay the Gagarin tax. You'll probably trash 3 or 4 cards max. This card seems to be better utilized against central servers with multi-access support. You can build your deck around this concept, but you never know if you will be facing an asset-spam deck. So, lets say we hammer the centrals. one, By Any Means, 2, Legwork, 3, The Maker's Eye, 4, another plain old run against R&D or HQ. This will net you 7 trashed corporation cards, including that costly Jeeves, and those un-trashable ICE and Operations. That seems very worth it. But you need to have the correct cards in hand, in play, and the credits to get into the servers; a tall order. And worth noting is the fact that this card can kill you. You have to trash any cards you access. So access too many cards and you could flatline yourself. At least the corporation doesn't have the ability to spring ambushes. But you'll probably need damage protection in the form of I've Had Worse or Guru Davinder (expensive). And those agendas you access? Trashed. Maybe have a Film Critic installed to help with that. Anyway, I'm out of work in five minutes so... A potentially good card, but it needs a lot of support cards to make it worth it. So what about this with God of War, Counter Surveillance, and Jarogniew Mercs for protection? So as Nullun suggested, Deep Data Mining is probably the best bet. Trash 5 cards in one run. So this card may boost Anarchs back up to degenerate tier 1 status. As of writing this, the Counter Surveillance/God of War deck archetype is real and played, if not top-tier stuff. And by using its patented multiaccess combo with 20+ tags (obtainable by installing multiple God of War's) in conjunction with By Any Means you win the game. Immediately. It looks like a Runner equivalent to old CI7 builds, whereby if the opponent has not won on turn 10, they lose, in this case by being decked out. Back up plan includes regular heap breakers, Hades Shard and Clan Vengeance for some regular accesses out of archives, regularly. In classic Anarch fashion, you don't mind much about what gets hit, but if you do, Titanium Ribs is there to help. Draw through your deck to get Obelus online ASAP, because otherwise you'll die. Feel free to install small Mercs with few counters during this time, as it is a unique card, and as such can be overwritten by installing a new one, gaining you more tags and increasing how much your opponent hates you. Play combo pieces or not as you like, because everything is going back in your deck anyway. Game Day. Backup plan if you don't get it. Draw like mad. Dummy Box should be down at some point as well. Furthers the opponent's despair as he can't touch your resources, and Best Offense does nothing. Scalp Melty. Your opponent groans as he knows what's coming. Install Mr Hoodie. Nearby tables turn to look at your opponent with pity. You go for it. Dean/EMP gets you through whatever puny 18 ICE they have defending R&D, or all the money you've been getting does. However you want to do it, you can. Also, add insult to injury, get revenge while you're there. Get kicked out of the venue, lose all your friends, your wife leaves you and your dog dies. But hey. You won. If for whatever reason, be it skillful counter play from your opponent/not enough time for infinite tags due to pressure, you don't manage to trash absolutely everything, use Hades to access their entire heap. You probably win. Disclaimer: This was all written before events could legally use Sovereign Sight, so most of this is conjecture. By Any Means us a bad card, disguised as a good card. 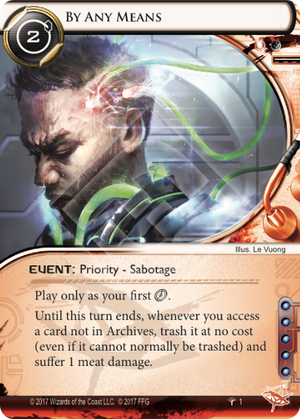 Timmy had no success in Netrunner, because piloting always counters him. Alone, the card need : - itself - 2c - a run - a draw to recover from the damage. Having I've had worse in hand is rolling a dice to prevent the draw cost. In the end, the card needs at least a clic or two of support, to trash one card from the corp. You're better with Maw, since that trash is random. Avoid by any means, when played in a non-combo. Other than that, well, it's a card.